We invite you to take advantage of our current special price of $59.95 (plus $10 shipping and handling in the US). Please don't forget to include your shipping address! When can I get a copy of The Coverlet Book? 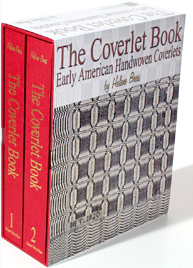 The Coverlet Book is now in stock and ready to ship. What does shipping cost to Canada? What does shipping cost to my country? When we get this request, we go straight to the US Postal Service web site at: www.usps.com. This will typically give us the most options for the lowest cost. You are more than welcome to visit this site to get a quick estimate. We are happy to look up the price for you, but if you are in a hurry, this is a good place to look. We also ship the book by UPS, but international shipping costs can be quite high from them. The shipping weight of the book is 14 pounds. What is the current special offer? To make The Coverlet Book a little more affordable, we are now offering The Coverlet Book for $49.95 (plus $10 shipping in the US). We must collect the 6% sales tax from Maryland residents. How much does the book weigh? The shipping weight of The Coverlet Book is 14 pounds! While you are wating for your copy, may we recommend some upper body exercises? Can I order The Coverlet Book online? YES! US Residents may use the following button to order and pay with PayPal. Shipping is different to different countries, so we don't have anything as convenient yet. This is the easiest way to get your copy of The Coverlet Book? Is there a dealer discount? No. There are currently no special dealer prices. I still have a question. Who do I talk to? Please note the above copyright. All email addresses and other contact information are for the exclusive use of Flower Valley Press, Inc. customers for matters concerning purchasing books from Flower Valley Press, Inc. We are not interested in buying anything from anybody. Therefore, any attempt to sell us anything using contact information from this or any other source will be considered a violation of our copyright in this contact information.